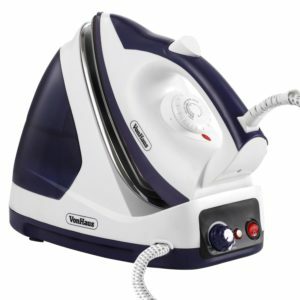 I thought that I would put together a page that shows the cheapest steam generator irons, that are currently available in the UK market place. So what does “cheap” actually mean? 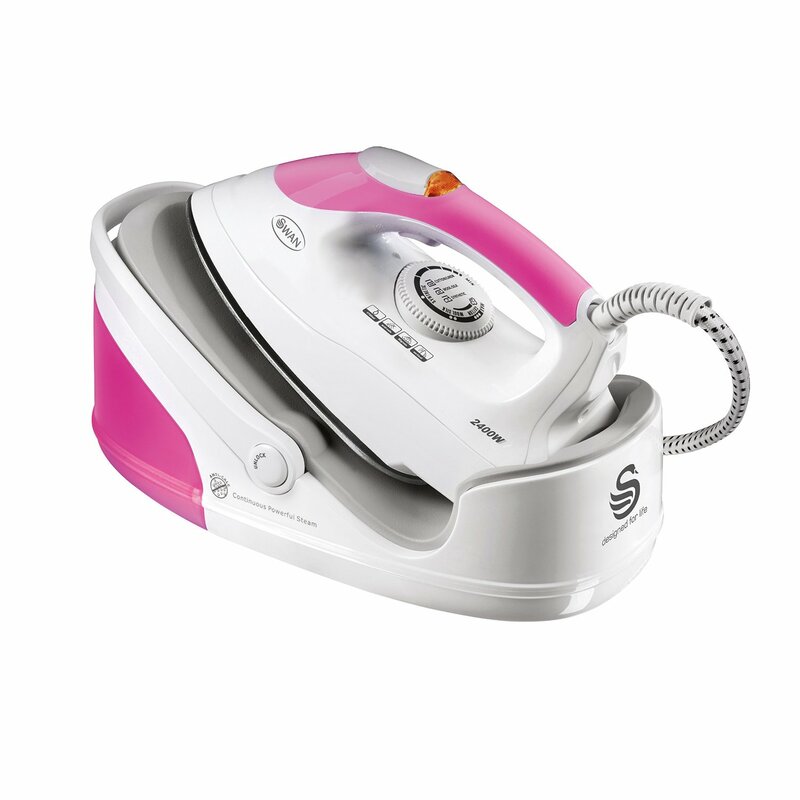 Well to help put it into some comparison, the average price is around £170-250 for a top rated iron. They are from brands like Tefal, Philips and Morphy Richards. There are some of these available in and around the £100 price point, and at the higher end they are around £200. Those type of price points are simply not affordable for many people. That is why other brands have now started to release other models that are in fact much cheaper, and basically more affordable. Brands like Swan and VonHaus have now released irons that cost around £30-50. Now that does make these steam generating irons affordable for many people. There are also some of these that cost under £100, and usually in the price range of £60-80. So if you can afford to pay a little more, then these are in my opinion, better quality and will last longer. In this article I will cover off which models are available and will also do reviews of those. Now for this type of money it is important to mention that almost always, the reviews will not be as high as for the better models. For the good quality models you should expect to see rating of at least 4 out of 5 stars. With these cheaper irons, almost always they will be in and around 3.5 -4 stars. That is still not a bad rating, but I just wanted you to be aware, that at the end of the day you actually do get what you can afford to pay for. We would all like to drive a Porsche but most of us can’t afford that luxury. Anyway, let’s have a look at what is actually available. This model is from VonHaus. You can pick this one up for just under £30. In terms of rating, buyers have given this one an average rating of 3.7 out of 5 stars, or roughly a 74% satisfaction rating. So it is certainly cheap at that price, and the majority of buyers thought it was good value for money. It has a pretty powerful 2,600 watts of power and can produce a steam rate of 40-50g per minute. You can also adjust the temperature control. It has a 1 litre tank and for most people that will allow them to do a full weekly iron, without having to fill the tank again. The tank is detachable so as you can take it to the nearest water tap to fill it up. This one can also be used for vertical steaming which is handy for curtains, dresses and suits. I have done a more detailed review, which you can read by clicking here. Please note this is not currently available at Amazon UK. This one costs around £60 and also has a 2,200 watts of power. This one is a new release, so there are not a lot of reviews to go on. Those who have bought it though rate it as a 5 star product. Just be careful though, as I always like to see more reviews, before being able to get the full picture. 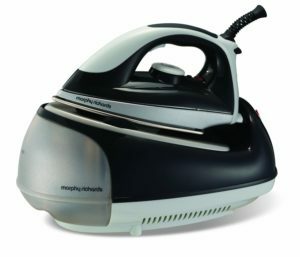 The good news is though that this one is from an excellent Morphy Richards brand. It is also part of their “Jet Stream” range and I know that all of that range is very good. So there are some good signs here. It produces 70 grams of steam per minute which is good, and has a 1 litre detachable tank. They have included quite a new feature, which is a gel handle, and that makes it easier to lift and also to grip the iron itself. This is a model from Breville and they make a number of models. This is their cheapest one at the minute and is priced at around £65, and gets an average rating of 4 out of 5 stars. 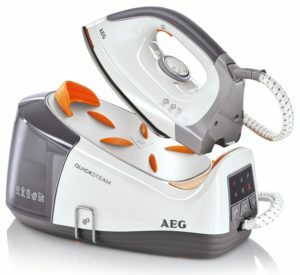 This one has a good 4.5 bars of pressure which can generate 110 grams of steam per minute. It uses 2,200 watts of power and also has a ceramic soleplate. It heats up very quickly and has a one litre detachable water tank. All round this iron delivers a pretty powerful performance. It also looks really good as well. 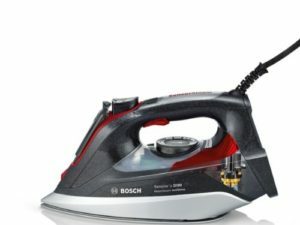 This one is also very good for vertical ironing so curtains, dresses and suits will be easily ironed using one of these. You should be aware that this one was much more expensive when it was first released, but it has dropped quite a lot in price since then. This is another well known German brand and are part of the Electrolux Group. This particular model costs around £65 and gets a very high 4.8 out of 5 stars. Please note and this is important – this iron comes with a European 2 pin plug, so you will need to buy a UK adapter to make it into a 3 pin plug. Now from the reviews, it is clear that buyers really like this one. So as long as you can get a UK travel adapter, then this one might well be worth some consideration. Those cost £1-2 so always a handy thing to have. I have a couple that I use when travelling. The instructions come in English, but one buyer has advised that the guarantee is written in the German language. It has a 1.2 litre capacity detachable water tank, and has 2,350 watts of power. Now this one is the best seller on Amazon right now and for very good reasons. 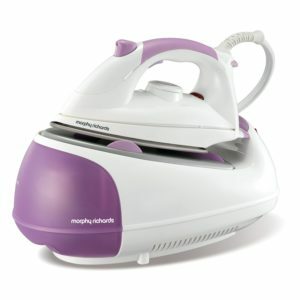 It costs around £75, is from Morphy Richards, has nearly 400 buyer reviews and an average rating of 4.4 out of 5 stars. So if you want something that thousands of other people have bought, is high quality and affordable, then this is probably the one for you. It has a diamond sole plate, a 1 litre detachable tank and is powered by 2,400 watts. 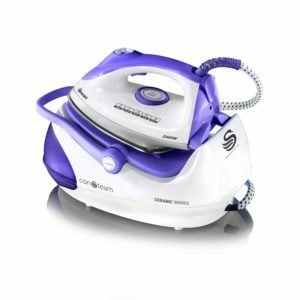 More importantly, this one can produce a full 100 grams of steam and that will make short work of any creases and wrinkles, and in a very short space of time. This one also heats up really quickly and you can adjust the temperature easily. This model costs around £70 and gets an average rating of 4.1 out of 5 stars. This one uses 2,400 watts of power and 90 grams of steam per minute. 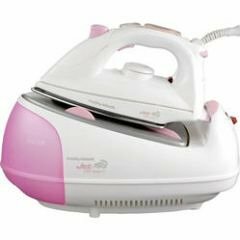 What makes this one slightly different to the rest, is that this one has a ceramic soleplate, and that does make for an easier glide over the clothes being ironed. It has a one litre illuminating water tank and is a good one for those of us who like to use vertical steam. 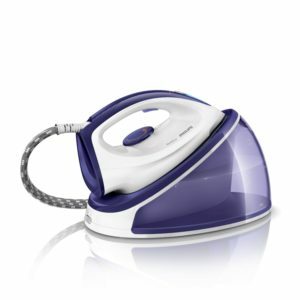 A tank of this size can give you around 3-4 hours of ironing, if you can stick it that long. Overall it looks pretty good, it is light and it has a carrying handle, which is useful when you need to store it away. It uses filters for cleaning, so just be aware you will have to buy these from time to time to keep the iron in good working order. You can read my detailed review by clicking here. This model costs just a tad under £70 and is rated at 4.4 out of 5 stars, so again a good quality product. This one has 2,400 watts of power and can produce 90 grams of steam per minute. Now this one from Swan has a much bigger 1.7 litre detachable water tank. That just means less trips to the water tank to fill it up. If you hate ironing, as many of you do, then this will certainly speed up that laborious task. This one is also pretty easy to use. The manufacturers advertise this one as red/white, but as you can see from the image to the left, I would say it is pink/white. I mention this in case you are trying to match it in with any other equipment. There are a lot of people in the UK who love the Bosch brand. This one costs around £75 and overall has an average rating of 4.3 out of 5 stars. It has a 3,120 watts of power, produces 65 grams per minute of steam, and also has the added benefit of a 200 gram shot. That is used for things like stubborn wrinkles on jeans. I can tell you that it works like a treat. The tank is however much smaller with a 400 ml tank. Now that is enough to do a lot of ironing, but for a typical iron you will probably have to refill the tank maybe 2-3 times. So as you can see this one has some really nice features, with the only drawback, being the smaller tank. You can Read my Full Review by clicking here. This is another model in the Jet Stream range from Morphy Richards. This one costs around £77 and has an average rating of 4 out of 5 stars. This one uses a stainless steel soleplate and that makes a good difference. It uses 2,200 watts of power and weighs around 3.8 Kg. 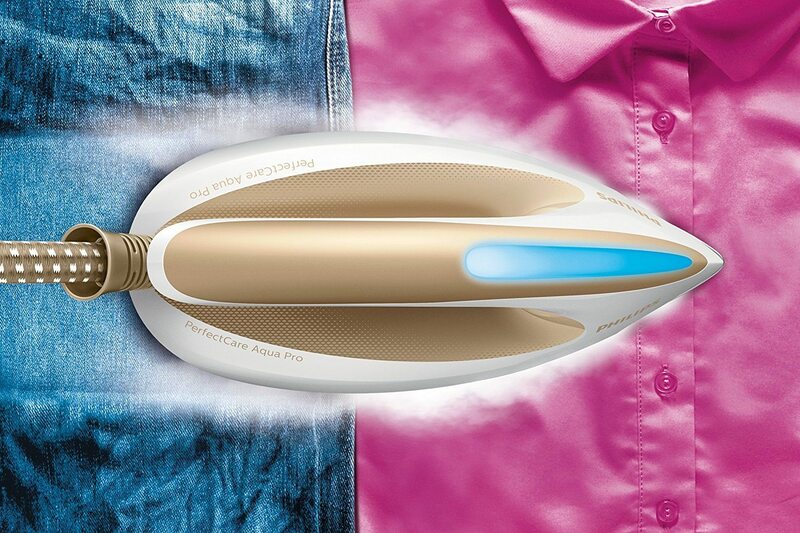 It has a one litre detachable water tank and can generate 90 grams of steam per minute. Now this one is not a popular a choice as the one I have shown above, but buyers so seem to like this one as well. If I was pushed for one or the other, the 4244 model, I have covered above. I have done a more detailed review which you can read by clicking here. 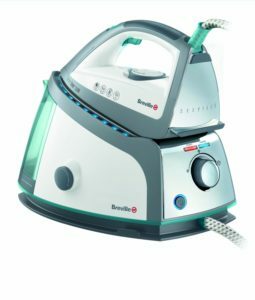 This model from Philips costs around £85, and although more expensive, you are now getting into the realm of much higher quality steam generating irons. There are around 100 buyer reviews and they gave this model an average rating of 4.2 out of 5 stars. As an example you now have 4.2 bars of steam pressure, 95 grams per minute of steam and a 120 gram steam shot. This model is powered by 2,400 watts of power and has a 2 minute heat up time. The water tank is detachable and can hold 1.2 litres of water. That is more than enough to do a full batch of ironing.